Last week presented a relatively rare late winter opportunity – fresh snow on the local mountains combined with a relatively clear sky. I have had a number of Vancouver related snowy images in mind for several years, but weather and other factors conspired against me getting all the way to Vancouver. This year has been a good year for the skiers, but that doesn’t mean the snow is sitting in the trees easily seen from sea level. Last week, however, we had a bit of fresh snow and good weather so I went straight to Vancouver. One of the places I photographed last week was the Kitsilano Beach Park area just to the southwest of downtown Vancouver. I had not visited Kits Beach in many years, but this did show a great angle on the downtown buildings with the Northshore Mountains in the background. This photograph shows Crown, Goat, and Grouse Mountains (and some fresh snow) high above Stanley Park, the Lions Gate Bridge, and the fishing charter M.V. Edgewater Fortune anchored in English Bay. This is just a small portion of a much wider 20+ frame panorama that I will likely post later on. I liked how this one end of the photograph showed just the boat, the park, and the mountains – without much evidence of the big city right next to it. The M.V. Edgewater Fortune has a bit of an interesting history. Originally it was the HMCS Fortune (MCB 151) – a Minesweeper in the Royal Canadian Navy before it was decommissioned in 1964. It then spent some time with Greenpeace as the Greenpeace Two, and was later renamed the M.V. 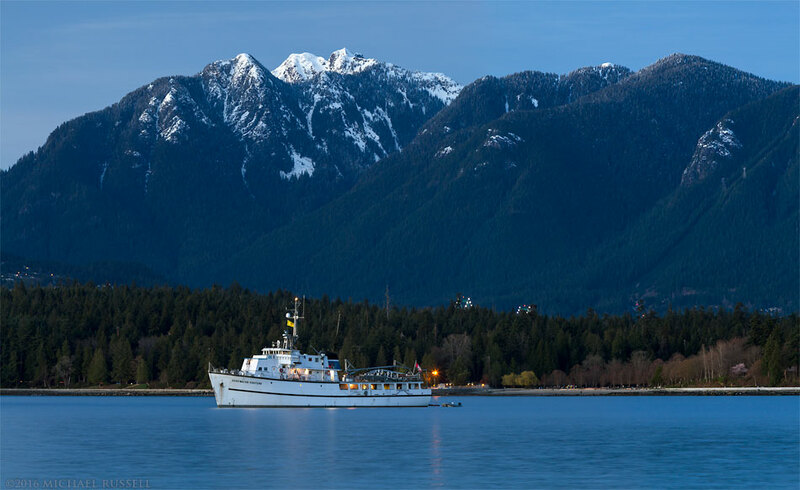 Edgewater Fortune and is currently utilized as a charter fishing yacht along coastal British Columbia. For more photographs of the Vancouver area visit my Vancouver Coast & Mountains Gallery.